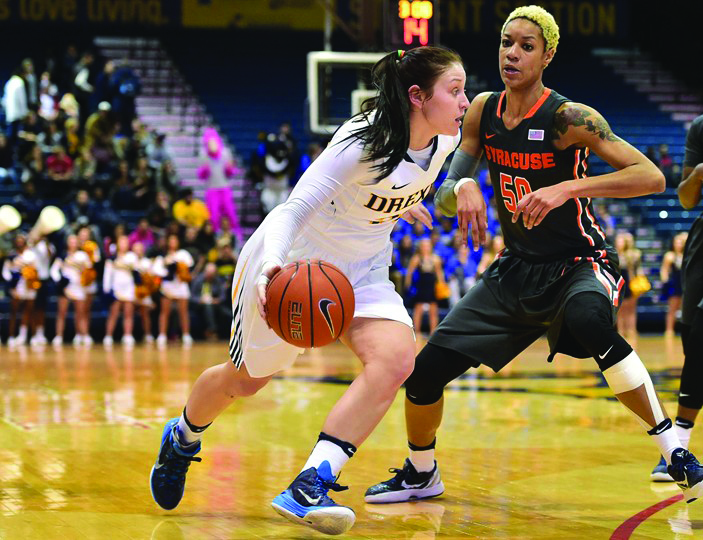 After a dramatic 53-49 overtime home victory against the University of Delaware Blue Hens Feb. 19, the Drexel University women’s basketball team clinched, at minimum, the Colonial Athletic Association Conference three seed. It was win number 20 this year for the Dragons and their first overtime triumph since Feb. 17, 2011 against the College of William & Mary. Prior to defeating the Blue Hens, the Dragons had come up short in their previous six overtime contests. “I’m definitely pleased with the win. We found a way to win today, that’s basically what it comes down to. It was not one of our prettier games, and I would say a month or so back we would have been on the losing end, so I was really pleased with the effort,” Drexel head coach, Denise Dillon said Feb. 19. In a game that was a bloodbath on the defensive end for both teams, the Dragons’ offense, for most of regulation, was the Jessica Pellechio show. Pellechio, a senior shooting guard, poured in a game high 23 points on seven of 13 shooting from the floor and five of nine shooting from three. The first half of the game was particularly low scoring, with the Dragons trailing the Blue Hens 18-15 by the end of the second quarter. Pellechio and Delaware’s Erika Brown were the leading scorers in the game at that point, both having scored a whopping five points. It was in the third quarter that Pellechio began to heat up. During that period, Pellechio scored 14 points, making four of six three-point attempts and also cashing in on two free throw attempts. On the strength of Pellechio’s offensive explosion, the Dragons took a 34-27 lead into the game’s final quarter. “I thought Jess played a really good game. So that was nice, and I thought she was under control,” coach Dillon said. However, the Blue Hens opened the game’s final frame in dominant fashion. Delaware began the fourth on a 7-0 run, led largely by Erika Brown, to tie the game at 34-34. Drexel senior Sarah Curran snapped Delaware’s run with a layup at the 6:53 mark, but Brown responded with a midrange jumper at the 6:30 point in the fourth, giving her seven points in a row for the Blue Hens. Curran, who had struggled with her shot all afternoon, hit a three-pointer, with a defender in her face and the shot clock winding down, at the 4:48 mark to give Drexel a 39-36 lead. Prior to connecting on that three, Curran was just two for 10 from the floor. “She wanted to take that shot. She had taken one a little earlier in the game and didn’t make it but, yeah, she came up with a big one down the stretch,” Coach Dillon said. Curran’s shot was not the only clutch three-pointer that a struggling Dragon connected on in the fourth. At the 2:42 mark, with Delaware then ahead 40-39, freshman Bailey Greenberg hit a rainbow three-pointer from the corner to put Drexel back on top 42-40. Prior to that basket, Greenberg, who has the team’s third highest field goal percentage this season, was just one for 10 from the floor. “You know Sarah Curran is going to continue to shoot, that’s her job. But I was so pleased that Bailey Greenberg took that shot,” coach Dillon said. Delaware was not yet out for the count as Makeda Nicholas made a jumper at the 1:38 mark to tie the game at 42-42. After both teams followed Nicholas’ jumper with empty possessions, Drexel got the ball back and called a timeout to set up a play with 43 seconds remaining. Pellechio, the hot hand for the Dragons up to that point, drove down the baseline and tried a reverse layup, but her shot sailed over the basket. Fortunately for the Dragons, junior Kelsi Lidge stood directly beneath the ball as it began its descent. With no Blue Hen anywhere around her, Lidge cleaned up Pellechio’s miss and put it back up for a layup, giving the Dragons a 44-42 lead with just 35 second to go. This time, it was the Blue Hens who needed a timeout to set up a final play. Whatever Tina Martin, head coach of Delaware, drew up in the huddle worked as Hannah Jardine was left wide open for a mid range jump shot from just beyond the charity stripe. Jardine didn’t blink, draining the shot for Delaware and tying the game at 44-44 with 13 seconds remaining. Coach Dillon called a timeout in the hopes of setting up a game winning play for Drexel. However, the Dragons were unable to execute as Curran turned the ball over to Delaware just before the clock expired. The game went to overtime, which was unfamiliar territory for the Dragons who, prior to last Sunday, had not been in an overtime contest this season. Drexel did not get off to a good start in overtime, giving up an and-one to Brown on Delaware’s first possession. As she had done throughout regulation, Pellechio responded for the Dragons and hit a jumpshot to cut Delaware’s lead to 47-46. On Drexel’s next offensive possession, Pellechio was fouled on a shot attempt and went to the free throw line. She cashed in on both of her attempts and put the Dragons ahead 48-47 with 2:46 left in overtime. Delaware was unable to score on their next possession, but Drexel was able to take some time off the clock by getting two offensive rebounds on its next offensive possession. Finally, Greenberg went to the free throw line after being fouled and made both of her shots, increasing Drexel’s lead to 50-47 with 1:09 left to play. The Blue Hens were unable to score another basket until there were 12 seconds remaining in the game, but by that time, Lidge had made two free throws of her own, and Drexel was ahead 52-49. With no other option to stay in the game, Delaware fouled Curran and sent her to the free throw line, hoping she would miss both attempts. Curran was off on her first shot, but made the adjustment and buried the second to ice the game for Drexel. With the victory, the Dragons improved to 20-6 on the season and 11-4 in the CAA. It’s the fourth time in her 14 year head coaching career at Drexel that Dillon has led her team to 20 or more wins. Since a 79-75 road loss to the College of Charleston Feb. 3, Drexel is on a five game winning streak. “It’s all about how you finish and we just continue to remind the team it’s controlling your own destiny. We figured that right after the Charleston loss. We can’t worry about what everyone else is doing, we’ve got to worry about us,” Coach Dillon said. At 11-4 in conference games, Drexel is currently in third place in the CAA, trailing James Madison University and Elon University who are both 13-2. Drexel’s next contest will be its final home game of the season. The Dragons will take on the JMU Dukes at the Daskalakis Athletic Center at 7 p.m. Feb. 24. It will be senior night at the DAC, and Drexel will honor Curran, Pellechio and Meghan Creighton. “We only have one more here at the DAC, which is sad to say with the group we have, with the seniors, but if you’re going to finish here at the DAC, you might as well finish against the best in JMU. We’re excited. We have three remaining, but we’re only focusing on the next one,” Coach Dillon said.